The purpose of this blog is to teach you about viruses and viral disease. This topic is not one that everyone understands, yet nearly everyone would like to. I was most disturbed when the Secretary of Health and Human Services, Tommy G. Thompson, referred to the anthrax bacillus as a virus. That incident crystallized in my mind the need to better educate the public about viruses. I am your host at virology blog – Vincent Racaniello Ph.D., Professor of Microbiology & Immunology in the College of Physicians and Surgeons of Columbia University. Why am I qualified to teach you virology? I have done laboratory research on viruses since 1975, when I entered the Ph.D. program in Biomedical Sciences at Mt. Sinai School of Medicine of the City University of New York. My thesis research, in the laboratory of Dr. Peter Palese, was focussed on influenza viruses. That’s me in the black and white photo below, taken in 1977. Yes, I’ve changed. 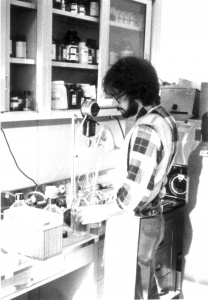 In 1979 I joined the laboratory of Dr. David Baltimore at Massachusetts Institute of Technology, where I did postdoctoral work on poliovirus. The moratorium on cloning full-length viral genomes had just been lifted, so I proceeded to make a DNA copy of poliovirus RNA, using the enzyme reverse transcriptase. I cloned this DNA into a bacterial plasmid and determined the nucleotide sequence of the poliovirus genome. In an exciting advance, I found that a DNA copy of poliovirus RNA is infectious when introduced into cells. This was the first demonstration of infectivity of a DNA copy of an animal RNA virus, and it permitted previously unthought of genetic manipulations of the viral genome. Today infectious DNA clones are used to study most viruses. In 1982 I joined the faculty in the Department of Microbiology at Columbia University College of Physicians & Surgeons in New York City. There I established a laboratory to study viruses, and to train other scientists to become virologists. Over the years we have studied a variety of viruses including poliovirus, echovirus, enterovirus 70, rhinovirus, and hepatitis C virus. As principal investigator of my laboratory, I oversee the research that is carried out by Ph.D. students and postdoctoral fellows. I also teach virology to undergraduate students, as well as graduate, medical, dental, and nursing students. Since I think about viruses every day, and I have always been interested in teaching others about viruses, this blog seemed to be an ideal forum to convey some of my knowledge on this topic. After starting this blog, I became interested in using ‘new media’ (internet-based media) to disseminate information about viruses. I’ve summarized my use of this format in an article entitled “Social media and microbiology education“, which you can find at the open-access journal PLoS Pathogens. 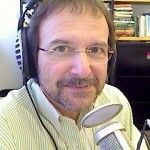 In addition to writing about viruses on virology blog, I also host and produce five podcasts: This Week in Virology, This Week in Parasitism, This Week in Microbiology, This Week in Evolution, and Urban Agriculture. You can find them all on iTunes or at MicrobeTV. I teach a virology course each spring at Columbia University, and I post videocasts of each lecture at the course website, at YouTube, at iTunes University, and at Coursera. If you would like to learn about our work on viruses in more detail, please visit my website at Columbia University, or my Wikipedia page. You might also like to follow me on Twitter or Google+, where I often provide links to interesting stories about viruses; on YouTube, where I posts videos about viruses; or on Instagram, or the This Week in Virology page on Facebook. I have also written about my work on this site; links to some of these articles are provided below. All of the opinions that I write on this blog are mine, and in no way represent the views of my employer, Columbia University. This information is provided for educational purposes only, and should not be considered medical advice. If you think you are sick, see your doctor. Links to other sites to not constitute endorsements of those sites.